Annie Baker’s Pulitzer Prize play “The Flick,” at 12th Ave Arts, focuses on several co-workers toiling in a fading New England movie house. For some, a movie theater is an endangered cinematic shrine. To others, it’s a place to bring a date, catch a nap or pass on the way home to stream films from Netflix. To the menial workers in Annie Baker’s 2014 Pulitzer Prize-winning play “The Flick,” a shabby Worcester, Mass., movie house is a refuge. An existential limbo-land. And maybe a dead end. With the scrupulous clarity of a compassionate microscope, Baker magnifies the daily routine of three unfulfilled co-workers as they collect trash, tear tickets and work concessions at The Flick. Runs through April 4 at 12th Avenue Arts, 1620 12th Ave. E., Seattle; $15-$30 (206-661-8223 or wearenctc.org). 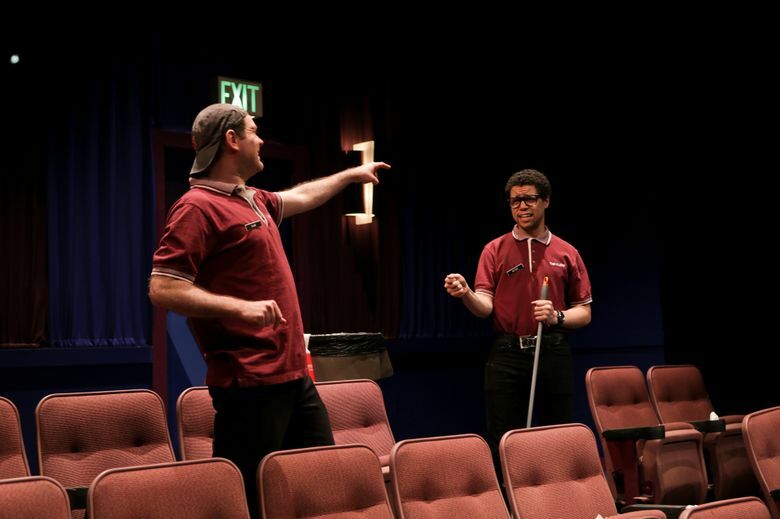 So why should we care, watching New Century Theatre Company’s accomplished local debut of “The Flick” at 12th Ave Arts, whether 35-year old Sam (played by Sam Hagen) gets an unlikely promotion? Or if projectionist Rose (Emily Chisholm) is really a lesbian? Or why the brainiac new employee Avery (Tyler Trerise) would choose a brain-dead gig sweeping spilled popcorn? Here’s a reason: A society that ignores or romanticizes the lives of low-wage younger adults does so at its own loss. Attention must be paid to the millions of unsung lives lived in flickers of hope and desperation. And in “The Flick,” Baker’s argument for our interest is more persuasive than in her equally pensive slice of realism, “Circle Mirror Transformation,” seen at the Seattle Repertory Theatre in 2011. In many short scenes (and about 180 minutes), The Flick staff toils on Andrea Bush’s superbly faithful replica of a dumpy movie house (seats, aisles, projection booth et al). They mop up soda, joke around, stare into space and make tentative, discomfiting overtures to one another in funny-sad encounters that are brief, and stinging. Sexual attractions arise. So does a tense, telling bit of class warfare, over a ticket scam gone awry. The preppy 20-year-old Avery lives vicariously through movies and is squeamish about a lot of things — not just disgustingly messy bathrooms. Yet not until he’s on the receiving end of a crude sexual come-on do we see what a crippled, alienated soul this youth is. Trerise is terrific, as he explores Avery inside and out, his ungainly body and fractured spirit. Rose and Sam gradually unmask their guarded psyches and circumstances, too. Whipping around in a wildly uninhibited and seductive dance eruption, the combat-booted, frizzle-haired Rose runs pistol hot. But she also can go ice cold, her impetuous highs dissolving into stony sulks. Curiosity and moments of self-awareness are her saving grace, thoughtfully expressed by the excellent Chisholm. As for Sam, 35 and still living with his parents and earning peanuts, he’s (arguably) the most trapped of the three — and the most opaque. Largely through nuanced body language, Hagen registers all 50 shades of Sam’s discontent. Baker tests modern attention spans with pauses and longer silences, and a refusal to pump up or resolve conflicts. But her naturalistic style lends itself to exploring something pervasive and ineffable: the free-floating, unutterable loneliness in an America where winners take all and losers languish on the sidelines.